Fernwood Pacifica Drive to Top of Stunt (Including Old Topanga) – If you want variety this is the ride for you. Lots of climbing (some easy and some hard) and a great fast descent make this an amazing but tiring ride. This ride contains two good climbs. First you get to climb Old Topanga (honorable mention climb) in reverse and then after a fun descent down Old Topanga Canyon the real climbing begins. Red Rock Road is midway down Old Topanga Canyon. Though this is not part of the route it is a really fun diversion and is easy and flat. Worth the few minutes it takes to get to the end just to enjoy the very cool geology and unique area. It is really long. Some would argue this is three separate climbs but I consider it just two. In total you are looking at over 12 miles of fun, suffering and bliss on this fantastic ride. Alternative routes. Boy do you have to check out my variation that goes up Grand View and Observation Roads. Wow! Nothing beats a few 30+% pitches to add some fun to your ride. Once on Fernwood the serious climbing begins. Be prepared for lots of twists and turns as this fun road weaves its way up the steep hillside that amazingly enough has homes built all over it. Some of the houses have very natural & wonderful landscaping. The last few miles, after you turn onto Saddle Peak Road, ease off a bit and you get amazing views on both sides of the mountains as you traverse from one side of the Santa Monica’s to the other. This ride will take you over the highest paved road that is open to the public in the Santa Monica’s. It is nearly 100 feet higher than the top of Yerba Buena and about 70 feet higher than Stunt. An optional descent down Tuna Canyon Road. 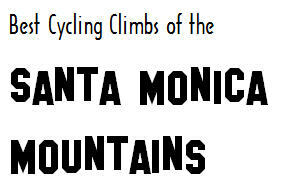 Every Santa Monica road bike rider needs to do that descent at least once in their life. Nothing beats a one-way road down a crazy narrow canyon where it is pretty much mandatory to stop at least once to let your brakes cool down. Ahhhhh, so much fun. It is also one of the best climbs around, but since it is illegal to go that direction on it, and I never do anything illegal, I have not listed it here. It would be high on this list however if I did it, which I don’t so... Did I mention its a good climb? 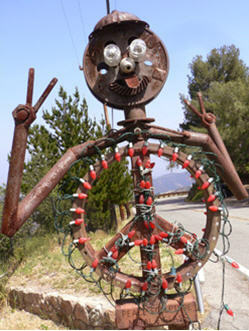 Hippie encounters on this road always keep things interesting. Traffic is fairly heavy on the short section (about 1/2 a mile) on Topanga to get to the base of Fernwood. Luckily that part is very short.